The time to protect you and your family is NOW. The Electro Magnetic Frequency (EMF) that radiates from your cell phone and those of your children and grandchildren could potentially have serious, long-term effects on health and safety. Stemtech, the leader in wellness technology, is now addressing another major health concern with D-Fuze, a simple yet sophisticated filter that adheres to your cell phone to disperse EMFs from potentially doing harm. And its effects and results are exceptional! EMFs can potentially be absorbed by the human body, particularly the brain. It has been widely reported in the media that EMFs produced by wireless devices may have adverse effects on human health and safety. D-FUZE protects your body from potential harm by dispersing EMFs to lower the specific absorption rate (SAR). 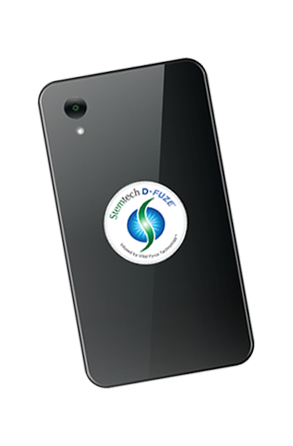 Stemtech’s exclusive D-FUZE is infused with a proprietary formula called Vital Force Technology™, which is a highly guarded process that lasts for as long as you own your phone. Vital Force Technology is only available through Stemtech. D-FUZE was in development for over 12 years by a team of scientists led by one of the country’s most respected scientific innovators. Specific Absorption Rate (SAR) is the standard set by governments all over the world to measure cell phone radio-frequency energy.